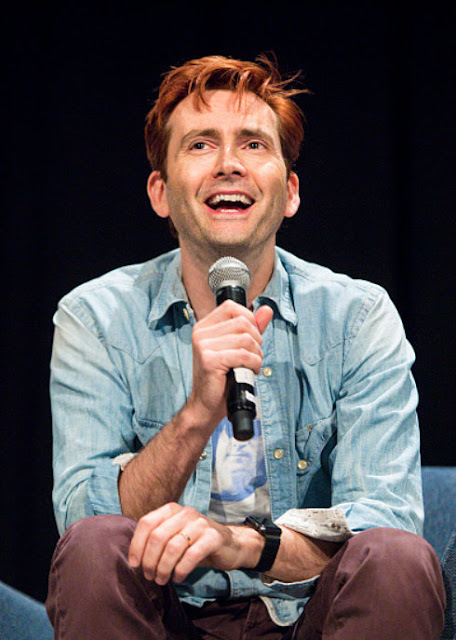 Yesterday David Tennant took part in a Q&A panel at Wizard World's latest fan convention in New Orleans. Here's the highlights from David's answers to fan questions posed during the 45 minute session. "[The most Scottish thing about me is] my ginger hair, which I can't really claim entire ownership of...but I've got it for the next maybe two months"
"Most of me is Scottish - there's a bit of Irish in me - but I'm born and bred in Scotland to two Scottish parents - pretty much all Scottish"
"Has anyone tried tattie scones? I like a tattie scone, which is a potato scone, like a potato cake. The Irish call them farls. They're like a flat bread thing made of potatoes and you toast them. If you're feeling really Scottish you can deep fry them in a pan. With a fried egg on top, that's pretty good...I urge you to try a potato scone." "You almost don't want to say it out loud because then if you don't do it then it comes back to bite you in the arse! I feel content with the things I've knocked off my bucket list...I'd certainly like to do more Shakespeare at some point. I don't want to jinx it! "But there's also things you don't know yet, I didn't know, I'm ashamed to say, the novel Good Omens until I got the script and I thought, 'Where's this been all my life, this is the most fantastic part in the most extraordinary story'. So you're always hopeful that something like that is just going to appear and present you with the part that you never knew you wanted to play so much. I just keep my fingers crossed that that will keep happening." Telling stories and watching stories and, when I was very young which is when I decided I wanted to be an actor, it was watching shows on TV and in no small part shows like Doctor Who, that kind of escape, that kind of release into a world of possibilities...that idea matured with me as I watched more adult stuff and then I started going to theatre and being influenced by that, so the notion of being an actor sort of grew up alongside me. But the initial thing was being excited by shows on TV, that was where I first saw actors and first understood the idea of what it was to be an actor...I thought that was the most brilliant idea and the most fantastic thing, and the notion that it could be a job took hold of me. "I'm halfway through The Handmaid's Tale which is amazing, and also The Good Place, which I love. Has Ted Danson ever been that brilliant? He's amazing in it, he's having such a good time! I'm also catching up on my Marvel chums on Daredevil Season 2, which is also brilliant. "That wouldn't get me into any trouble at all if I had an answer for that! I love them all equally in their own special way"
"With Rose that was already the deal, I suppose, so I knew what I was inheriting there. I suppose vaguely there was a broad brush stroke that the Rose-Doctor thing was kind of a love story without certain elements of a traditional love story. They basically were star-crossed lovers. "Then Martha would be the girl that he would never see in that way so that would be a sort of unrequited love affair. We knew that was the story that we were telling. "With Donna we knew that was absolutely NOT the story we were telling! "With each of the three from my point of view, they were there for that year, a new companion for the start of each season, so there was clear direction for each one. So each version of that had a very different flavour, which was great from an acting point of view, a different thing to play." "It's weird, you grow up with something - I had a poster of Tom Baker on my bedroom wall and he'd signed it on the bottom. He came to John Menzies in Glasgow in 197...I'm not quite sure when it was, and he signed books, and I went along and got a Doctor Who monster book with a poster in the middle and Tom Baker signed it. Also in the queue that day I've since found out was Steven Moffat! And I've also since found out that somebody missed it, who came too late with his book and didn't get it signed - Peter Capaldi! So it's quite weird that three of us for whom Doctor Who has ended up being a large part of our lives were nearly in the same queue in John Menzies that day...I think it's fair to say to a greater or lesser extent that TV programme inspired us to get into the career we got into and we've all ended up being in it and it's ended up being a large part of our lives." "He was devastated. Rose helped him reform himself and influenced who he became when he regenerated into me. Her influence was very formative when the Doctor came out of this terrible war with all the extraordinary things that he'd been through...she helped him recover and become the man he became. So to lose her was devastating and yet, as ever for the Doctor, kind of inevitable and part of the tragedy of that character. Every relationship that he forms with anyone other than a Time Lord...was by its very nature transient because he is effectively eternal next to a human being." "Russell T Davies and Julie Gardner chose me for it so you'd have to ask them why. They asked me to do it and I said yes. Why, who knows, but I'm very glad it worked out." "Obviously it's lovely to have any sort of recognition at all. I think I was in the show at the time, it definitely gives you an advantage for things like that. I suspect if you did it now Peter Capaldi would probably win...I'm delighted to receive things like that of course, it's wonderful and flattering and makes you feel terribly humble and excited, and at the same time you're always aware that this part is bigger than any one of us who get to play around with it. It's an honour to be associated with it at all and to be one of the people that get to play with this magnificent role and, as Jodie is now discovering, it's a wonderful, thrilling and exciting place to be." "We had a wee chat but it's quite a unique job as it's a show that has so much history to it and it has a reach that's quite unlike other things. It's a bit of a cultural thing, who's going to be the Doctor is quite a news story really so to find yourself in the middle of that is a bit overwhelming. I think inevitably you look to people who might have been there before to go, 'What is this like, this madness that I've just entered into?' Of course she's a little bit trepidatious, but she's basically really excited. "What Jodie has become known for as an actress [is being] brilliantly, heartstoppingly emotional in something like Broadchurch...but if you know Jodie, she's so funny and rude, she's got this broad accent and he just sort of fizzes with energy and madness, and she is quite unpredictable and gloriously funny, and I imagine she'll bring a bit of that to it and her natural anarchy will be something that the Doctor will enjoy, I'll imagine. "It's a funny thing because Doctor Who was such a big thing to be part of and to leave it was such a big thing, that sense of it being a national story, who's taking over, you can't help but be aware of the magnitude. And having worked with people that you've grown to love and care for and enjoy working with, that day we recorded that final scene was naturally a very emotional time, so there wasn't a lot of having to get oneself into the zone. It felt sort of genuinely quite emotional anyway. In actual fact, with that very final moment where the Doctor says 'I don't want to go', we did several times and it was actually a question of reining it back a bit as it naturally felt terribly sad...it didn't take a lot of preparation that day." "I try not to have favourites because they were all so different and each episode had a new cast or was in a new place...and apart from the one person you went through the whole series with there was a whole bunch of new friends to play with. I enjoyed filming them all for different reasons and each one felt very different so it feels wrong to compare them...it feels somehow weirdly disloyal. I love them all. "This is what I've got red hair for! Good Omens is a novel written by Terry Pratchett and Neil Gaiman. Terry Pratchett is unfortunately no longer with us but Neil Gaiman is the showrunner, he's written the scripts and we're shooting it at the moment. "It's about a demon and an angel who have both lived on Earth forever and who have become sort of best friends, although they don't admit it to themselves, and between them they decide to avert the Apocalypse. The Antichrist has been delivered to Earth and they decide to try to make sure he doesn't come into his full power because they quite like living on Earth and they like doing the things that angels and demons aren't supposed to like, like drinking wine and having fine dinners and enjoying themselves. And yes, lots of things go on fire, some of which has been happening for real and and other bits which will be added cleverly by people with computers afterwards. It's been quite a dramatic shoot...it's a big old crazy epic novel and everyday there's a new deal with things exploding and prosthetic heads and special effects. There's more smoke than fire, the fire tends to be added in afterwards. Although just before we finished for Christmas we set fire to [the bookshop]...it was fun!" "I quite liked being Kilgrave, it was fun. Again, I didn't know the Alias comic books until that came about...I'd always loved Marvel comics but I'd not come across that set of books. It's just one of those incredible worlds that's been created...it uses the mythology of the Marvel universe and turns it on its head and then uses this character that's been around since Daredevil issue 4...taken in this new, dark, twisted direction, it's just great. When it's written that well and you've got someone like Krysten Ritter as Jessica Jones, what a treat to get to do something like that." "It was definitely the idea that...it would be a secret. Everyone thought that Marvel would keep this a secret, we'd just sneak it out, he'll just turn up, nobody would see it coming, and I said, 'That's great, so we're not filming outside at all...?' So then it was no longer a secret. I do appear in Season 2, but more than that I cannot say. I'm not in it that much but it's telling..."
"Yes, she was frankly lazy! If she just put in a bit more effort! "To be fair, he's a bit of a monster. It's fascinating playing a character like him because it's a fascinating conundrum. If everyone in the world acquiesces to your every demand I don't know that any of us could remain sane..how could you know if anyone was doing something around you because they choose to, as opposed to because they are compelled to. "That's one of the juicy things about that character - how can he be normal and how can he know when he's being a monster? He's STILL a monster, there's very little about him that's easy to love and his very obsession with Jessica is because he can't make her bend to his will and it becomes something that becomes his downfall. He probably deserved to die, I think that's fair to say. I don't think we can blame Jessica, she did what she had to do and she made the world a better place." "All I know is that at the end of any Final Space recording I can barely talk. There's a LOT OF SCREAMING. He shouts a lot, he's very angry. So I don't know if that makes him more evil, he's certainly angrier than those other characters. I haven't seen any of it finished so I don't know. It's an animated sci-fi comedy show, somewhere between Star Wars and The Simpsons, due on TBS in early 2018."